Super star Chef Master Eric Ripert addressing the guests. Bonjour! I will be the first one to admit it. I’m one of his biggest fans. The food, the preparation and the way he makes his signature sea food dishes look so easy to prepare, it is no wonder that French Chef Master, celebrity judge, author and television host Eric Ripert (rih-pair)is known as the Jack of All Trades and Master of Many in the world of international cuisine. Translation: the guy rocks…plain and simple. 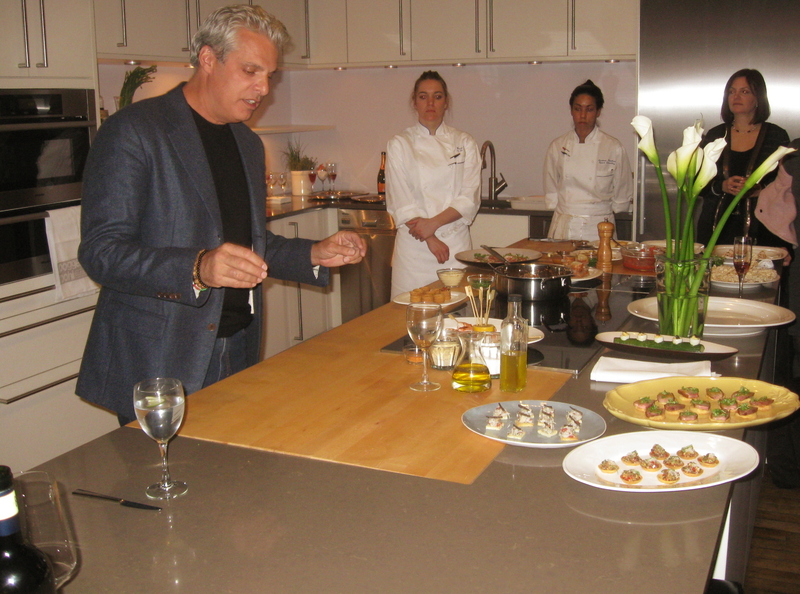 Ripert’s culinary skills are legendary and so are his taste buds. The French-born NY living celebrity chef’s claim to fame started way before any television show or recipe books were written. The Frenchman rose to peak stardom with his amazing talents as Executive Chef and co-owner of one of the most prestigious and distinguished restaurants in the world, Le Bernardin located in Manhattan. The hot spot often referred to as the “Temple of Seafood” serves the creme de la creme in seafood cuisine and caters to some of the most well know personalities and celebrities around the world. Top ranked consistently by the New York Times for the ultimate dinning experience, Le Bernardin is to fine dinning what the Eifel Tower is to France- an iconic symbol of prestigious, grace and culture. If you are lucky enough to get a reservation and want to experience the “Rolls Royce” in seafood dining, then do check it out www. le-bernardin.com. I recently met Ripert at a special and private press event at the fabulous, energetic and very trendy Anomaly studios run by the talented businessman Justin Barocas in Manhattan last week. The special gathering which introduced Ripert’s popular second season show “Avec Eric” to the press along with his cook book “Avec Eric: A Culinary Journey With Eric Ripert ” (Wiley) named after his show, was one of the most sought after media events of the cold mid-January week. Top editors from prestigious organizations including Luxe. Elle Decor,, O Magazine, Architectural Digest and Interior Design, graciously came to meet their favorite iconic chef and listen to what he had to say about his show, his kitchen and what inspires him to make such delicious food. 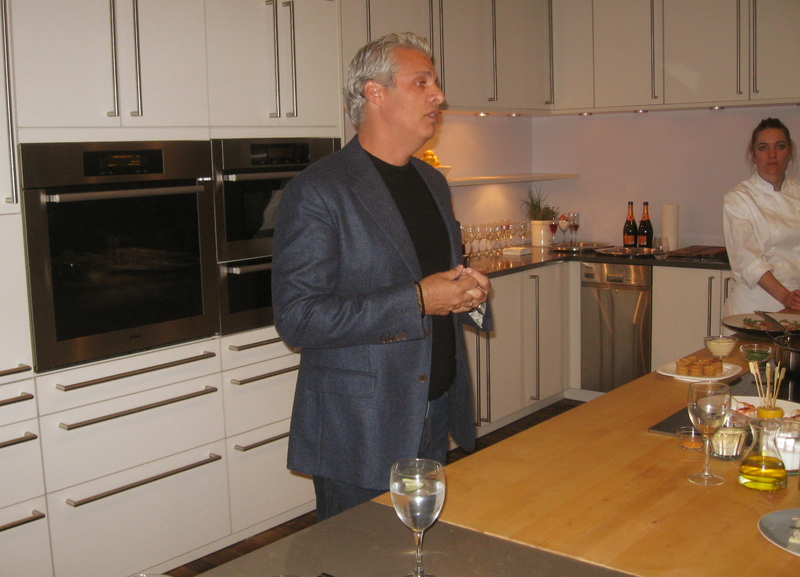 The media event was held in a specially designed kitchen influenced by Ripert and his team in the Anamoly studios that serves as the background for his popular television series “Avec Eric”. World home design companies like Poggenpohl, Miele and BLANCO helped design the kitchen with their products and the talented staff from Le Bernardin created some of Ripert’s special dishes and drinks for the guests that attended. 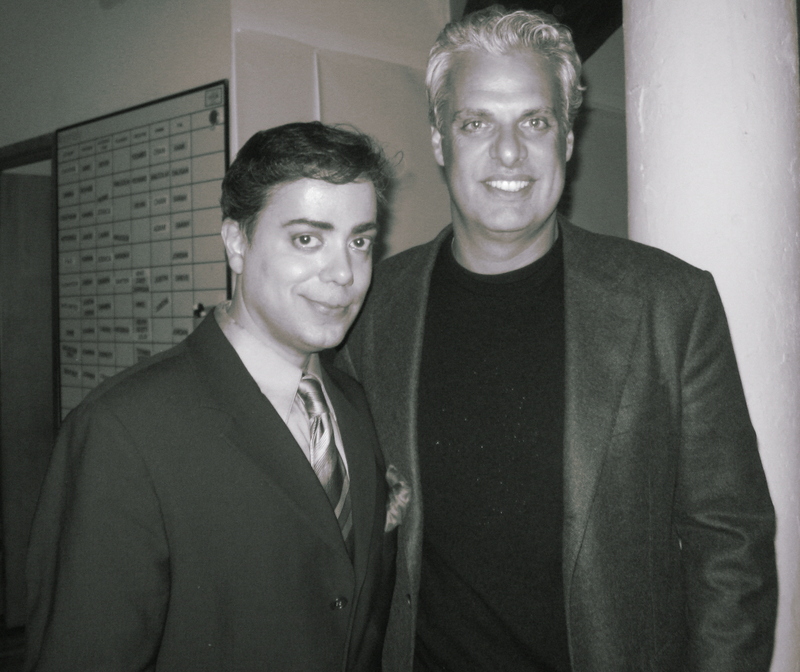 “Eric Ripert is an incredible chef with a loyal following around the world,” said one very attractive editor standing in line to get her book signed who said that she became a devoted fan of Ripert since he started his guest appearances as a judge on the popular television series “Top Chef”. “This book should represent the beginning of your culinary adventures in the kitchen,” explained Ripert. What I found to be the best part of the book was not only were there stories of how Ripert gets inspired with his work, but also how both the beginner and the advanced cook can both learn the basics and the advanced forms of Ribert’s signature and everyday dishes. Plus, you will be surprised to find out that some of the ingredients that are required to make those delicious dishes may already been in your have spice cabinet! Ripert gave editors and special invited guests a tour of his kitchen and explained to them why certain products were placed in the designated areas and how a kitchen should be set up for those trying to achieve a comfortable cooking template that feeds the creative process which then fuels the inspiration for your cooking. 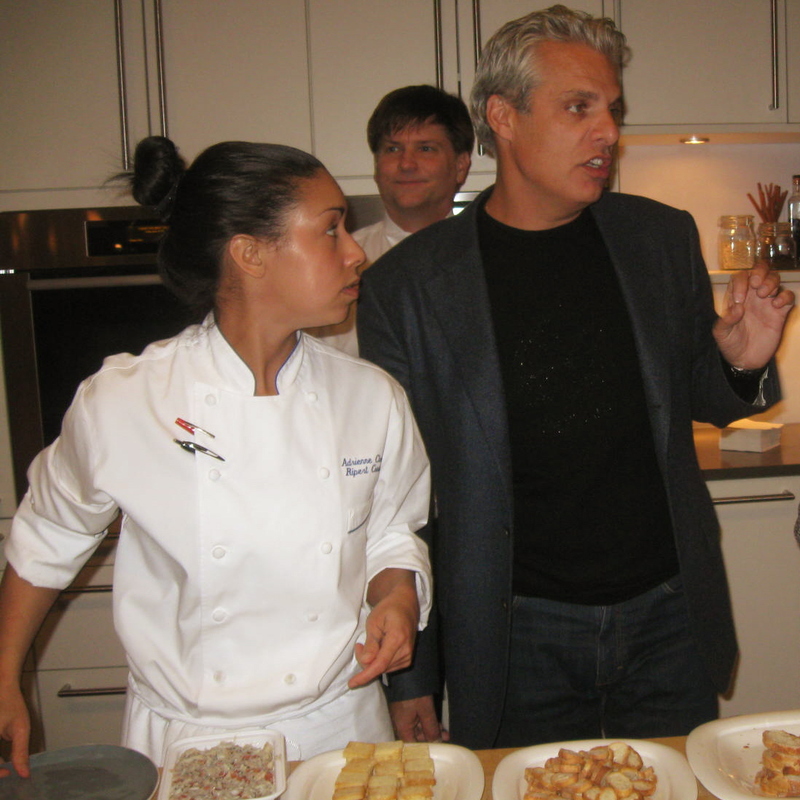 Ripert explaining why his kitchen set is so effective for his work. Ripert was also kind enough to sign his book “Avec Eric: A Culinary Journey With Eric Ripert” (Wiley), a collection of mouth-watering recipes from his culinary journey from Italy to California, that the celebrity chef shared with readers and how his cooking motivated his creative process for his culinary masterpieces. His motto “Great cooking does not have to be complicated” holds true in this book filled with amazing recipes and photos from his travels. Ripert’s show “Ave Eric” can be seen on the PBS and grab your notebook and pen when you watch it because you may create some culinary action that you didn’t know was in you!